You guys had a lot of great questions about the first part of “Keeping it Legal” and I want everyone to catch the answers. This is okay. You are not breaking any rules. The limit is 2 per computer/ ip address. If you have access to 3 computers and want 6 of a coupon that is okay. All 6 will have inidividualized securty features and are legitimate coupons. You do not ever want to buy a printable coupon online. There are some that sell them on ebay, you will have no way of knowing if this is a legitimate coupon or not. You do not want to unknowingly commit fraud. It is okay to buy newspaper coupons online. 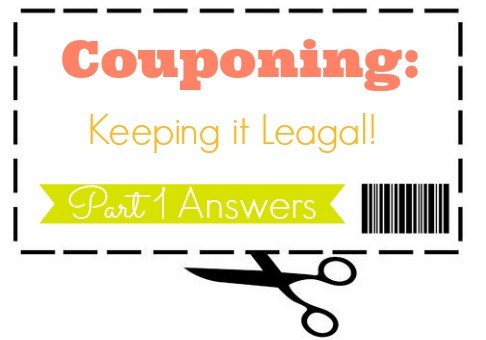 There is nothing wrong with having more of one coupon as long as you do it legally. Newspaper coupons are not a regular problem with fraudulent use. There are some that say that is against the terms on the coupon. Most sellers and companies (the coupon clippers etc) state that they are charging you a handling fee and not selling the coupon to clear up the legality of their of business. This would be the same as you paying you mother to mail you inserts from her paper. The folks that say buying more of a coupon is wrong go one step further and say that it is also wrong to send our coupons over seas. I think they have gone to far to say I can’t help out service men and women with coupons that are worthless to me!